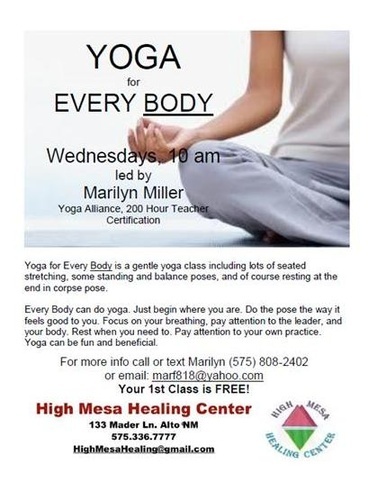 Yoga for Every Body led by Marilyn Miller, Yoga Alliance, 200 Hour Teacher Certification. Yoga for Every Body is a gently yoga class including lots of seated stretching, some standing and balance poses, and of course, resting at the end in corpse pose. Every Body can do yoga. Just begin where you are. Do the pose the way it feels good to you. Focus on your breathing, pay attention to the leader, and your body. Rest when you need to. Pay attention to your own practice. Yoga can be fun and beneficial.